a) the number of carbohydrates that can be ingested per hour without causing gastrointestinal stress (estimate: 1.1g per kilo if you are a man, 1g per kilo if you are a woman). 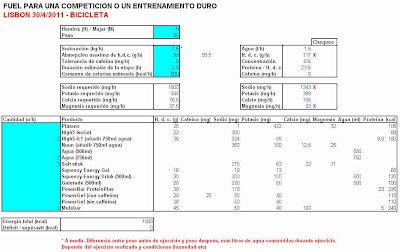 b) the concentration of carbohydrates should be around 6-8% to be isotonic (best absorption rate). If it is more concentrated, its absorption is slowed down. c) the amount of water and electrolytes (sodium, potassium, calcium and magnesium) lost by sweating should be replaced. This depends on your sweat rate and the typical electrolyte content of your sweat (which can vary tremendously from individual to individual and even from zone to zone). d) ideally you should consume protein in a ratio of 1g of protein for every 4g of carbohydrates. On the run it is pretty much impossible to meet these requirements but you can at least get close. The bike is what I call "meals on wheels" and gives you a chance to recover from the swim and at least start the Marathon as close as possible to on a full tank. 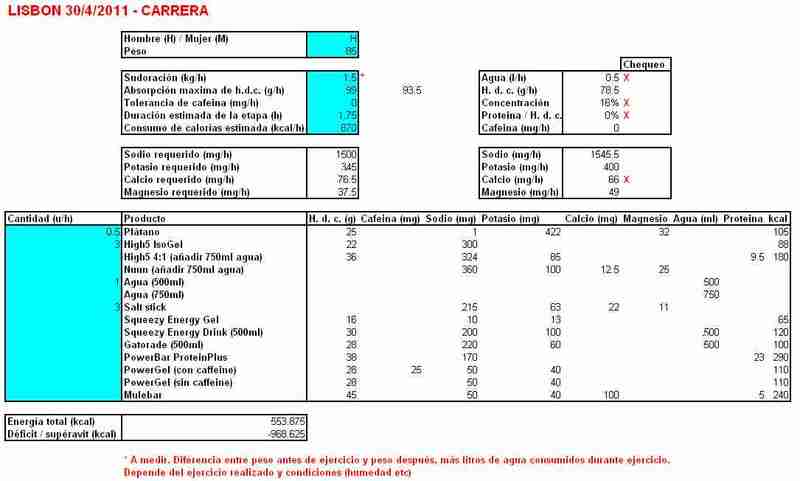 Here is my plan - of course I will have to make some adaptions according to the sports drinks they give out during the race but I hope I will be able to stick to it better than last year when I just went freestyle and started binging on Coca-Cola because I was suffering so. Amazingly (and coincidentally), the net calorie balance at the end of all the bike leg is 0 (in theory)! I base this on the guide from High5, my preferred supplier of gels. 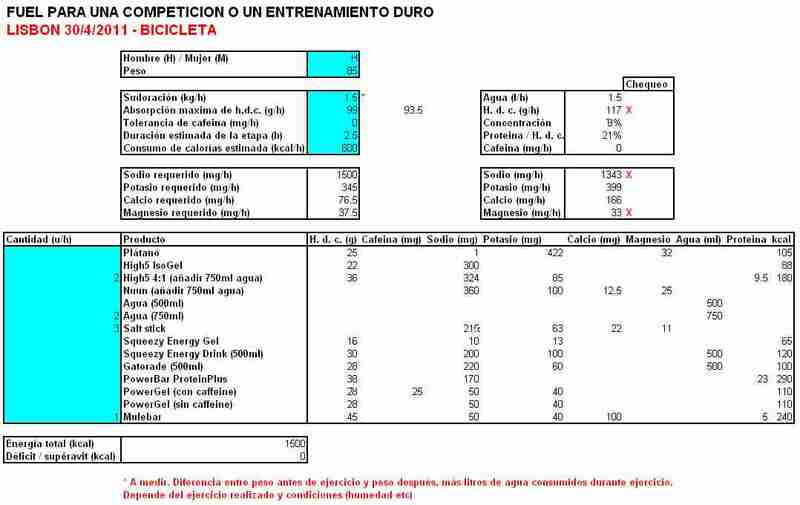 According to High5, during the 3 days before the competition you should try to consume 10g of carbohydrates per kilo of body mass. In my case, that means 850g of carbs a day - nearly a kilo! It is actually quite a feat - this isn't just a question of having a few big bowls of spaghetti. The only way to do it is to stuff your face with sickly gels and energy drinks all day long. To give you some idea, in a typical day I may consume about 300-450g of carbs, depending on how much exercise I had done that day; and that means packing in some 15-20 gels on top a day. A little trick the High5 guys propose is to do a short 10 minute warm up half an hour after taking the first dose in the morning, and then to do a 3 minute sprint on the bike to fool the body into storing more carbs. A tip from me is not to carboload with the same flavour gels you use in competition because you will likely be sick to death of them before you even start. On the day itself they recommend taking in 150 grammes of carbohydrates for breakfast. 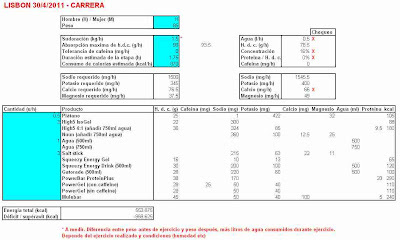 I'll have my normal breakfast and a gel / energy bar + energy drink. Just before the swim start, I'll take a last gel and energy drink. I don't know whether it was due to carboloading, having a good aerobic base or simply not going off too hard, but I did not hit a wall of any kind in the Marathon I ran back in November. So I will follow the same recipe I used for the Half Ironman as a kind of dress rehearsal for the Full Ironman. I'll also take a couple of salt tablets the night before the event and one for breakfast. I used to think that recovery was for wimps. Who cares what happens after the race? Of course, this time it really does matter because, if I get wrecked doing the Half Ironman, it will set my training back for the Full Ironman. In any case, there is nothing "cool" about having to walk down stairs backwards. Basically, it's important to take in carbs and protein (like the High5 4:1 Energy drink) as soon as you can. This means that you have to think about it before the race otherwise, by the time you get back to the hotel, it's already too late. All that means something like 50 gels / sports drinks, 15 salt tablets, 3 cereal bars and a banana for a Half Ironman and 65 gels / sports drinks, 30 salt tablets, 5 cereal bars and a couple of bananas for a Full!